All videos of Queen is in high quality music video VOB format. Queen - Best videos. Download in original DVD-quality VOB format. Before joining Queen, Brian May and Roger Taylor had been playing together in a band named Smile with bassist Tim Staffell. Freddie Mercury (then known by his birth name of Farrokh "Freddie" Bulsara) was a fan of Smile, and encouraged them to experiment with more elaborate stage and recording techniques after Staffell's departure in 1970. Mercury himself joined the band shortly thereafter, changed the name of the band to "Queen", and adopted his familiar stage name. John Deacon was recruited prior to recording their eponymous debut album in 1973. Queen enjoyed success in the UK with their debut and its follow-up, Queen II in 1974, but it was the release of Sheer Heart Attack later in 1974 and A Night at the Opera in 1975 that gained the band international success. The latter featured "Bohemian Rhapsody", which stayed at number one in the UK Singles Chart for nine weeks; it charted at number one in several other territories, and gave the band their first top ten hit on the US Billboard Hot 100. Their 1977 album, News of the World, contained two of rock's most recognisable anthems, "We Will Rock You" and "We Are the Champions". 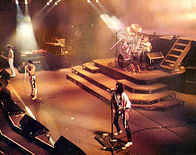 By the early 1980s, Queen were one of the biggest stadium rock bands in the world, with "Another One Bites the Dust" their best selling single, and their performance at 1985's Live Aid is regarded as one of the greatest in rock history. In 1991, Mercury died of bronchopneumonia, a complication of AIDS, and Deacon retired in 1997. Since then, May and Taylor have occasionally performed together, including a collaboration with Free and Bad Company vocalist Paul Rodgers under the name Queen + Paul Rodgers which ended in May 2009. Since 2011, May and Taylor have collaborated with vocalist Adam Lambert under the name of Queen + Adam Lambert. In late 2014, Queen will release a new album, Queen Forever, featuring vocals from the late Freddie Mercury. ETV Network Vital Hitz 2045 June 2001 ... and etc.